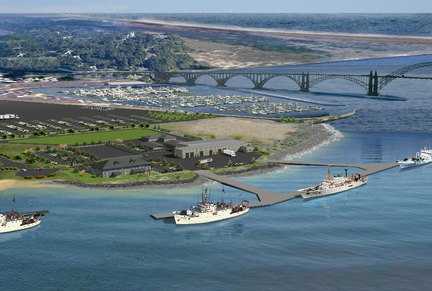 ...The port is building a 5-acre complex at Newport's South Beach that will include an administrative building, a 1,950-foot-long pier, a small boat dock, a workshop and parking. NOAA opted for the site because Newport's proposal was the "most technically sound" and its annual lease price of $2.5 million was significantly lower than Bellingham's proposal. "We don't see that as an issue," he said. "We will not be in the floodplain. All piers are in the floodplain before you build them. The elevation of the piers takes them out of the floodplain." The floodplain assessment is based on the projected impact of a flood that might happen once a century. The NOAA center is scheduled to open in May 2011. It would be home to four research ships, ranging from 90 to 230 feet long, plus a staff of 175, including 110 officers. NOAA conducts research on oceans and the atmosphere, and the facility would host visiting research ships as well. The economic impact is estimated at $19 million a year.